One thing I hope to do through this blog is to impart grace. For me, there's not a whole lot better than finding other women who know they aren't perfect but allow God to work in them and through them anyway. I love seeing ladies who let God shine through all their broken pieces, I need those women. So while I'm packing up our little house, I've asked a friend of mine to share some grace with you today. She's a mom who is brand new to also working at home, and she brings a real grace-filled (and funny) look into working at home with her two beautiful girls. She's also one of the women I mentioned above. I am always encouraged by her honest, yet hopeful, storytelling, and I know you will be too. Hello Pint-Sized readers! Well, not that I think any of you are as pint-sized as our dear Mackenzie, but you know what I mean. 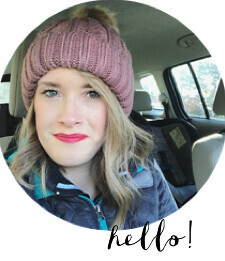 My name is Ashley and I write a police-wife-mother-of-two-lifestyle-blog... if that's a thing over at Written On Her Heart (formally 5ohWifey). I am also The Influence Conference manager for The Influence Network. I am really excited to help Mackenzie out as her and her seriously adorable family make the move to go plant a church in Seattle. So, Mackenzie thought something I could speak to here on her blog that she doesn't is being a brand new work at home mom. And y'all, that feels so weird. You see, God has a sense of humor. Earlier this year, for month's God had been convicting me to let go of sponsorship on my blog. When I started to think about letting go of that income I started thinking I'd have to let go of some blogging extras including conferences. Sadface. Just days after I posted that, I was offered the job as Conference Manager for the Influence conference. It was so crazy and awesome how God put that all together. You can read all about it HERE. I was as excited as my daughter Reese is about flowers. That's pretty excited. But now I find myself in this really weird season. I just had my second daughter at the end of April so now I have two kiddos, a husband who works crazy hours, a blog, a job on the core team, and a conference to plan. Woosh. Y'all, it is no joke. I have written before on how to do it all as a mom. Guess what? You can't. Same goes (even more so?) for being a work at home mom. Between wife-ing, mothering, and working sometimes it feels a little stressful to try to be doing all the things and connecting with all of the people. I know you feel me, baby Kendall. So, I've decided to stop striving to do all the things. I just can't do it. And neither can you. And I know, I know, the whole "I can do all things through Christ who strengthens me" thing. And that's true. But God also calls us to be good stewards of our time here. I can't follow and like all the things and all the people on all the social media sites. I can't write a blog post every.single.day. I cant write these long heart emails to all the people. I can't attend all the parties and play groups. I cant clean all the rooms on all the days. I cant make all the meals from scratch. I can't do it all. And I don't think God wants me too. So, I've had to be super intentional with my time. I've had to combine my breakfast and devotional time into 30 mins where Reese is eating and Kendall is on her playmat. I've had to answer emails first thing in the morning as Reese plays outside and Kendall is snuggled against me in her moby or in her swing. I've had to put down the job to make sure Reese and Kendall get their mom for the morning playdates/ platime/ errand running. I've had to work and clean during naptime (ugh.) I've had to meal plan and include easy days where I know I'm going to need a fast dinner. I've had to say no to things that are just not life giving to me and my family. Because it frees me up to say yes to the things that are. I haven't figured this all out. I am still having to write and rewrite my personal and professional boundaries. I am having to seek my coworkers, my bosses, my kiddos, my husband, and my God for guidance. I am just stumbling through this working mom thing. But I mean really, aren't we all just stumbling through this grown up thing, pretending like we know what we're doing? No? Just me? Isn't that encouraging? Don't you love how Ashley isn't afraid to "re-write" things? (Instead of just quitting or continuing on but living in shame?) I love that there is room and grace for her family life, even in the midst of having professional responsibilities. You can find Ashley at Written On Her Heart, on Twitter, and often at the Influence Network blog!